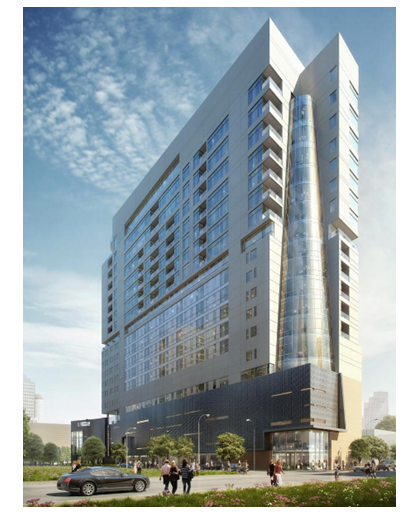 ​​​SAN ANTONIO – Downtown San Antonio will soon get 20 stories of luxury hotel and condominium space. The mixed hotel-condominium development will include a Thompson Hotel—with 167 rooms—and The Arts residence, a 66-unit luxury condominium. ​There will be a steep price-per-sf breakdown, with one-bedroom units as small as 735 sf, and a three-bedroom penthouse as large as 7,324 sf. The price range for The Arts starts at $400,000 and goes up to as much as $5 million for one of the five penthouses. The two-parcel site directly across from Tobin center will include a restaurant on the ground floor and a pool deck overlooking the river, as well as 6,900 sf of meeting space and a 3,600-sf ballroom. The DC Partners and Universal Service Group partnership is moving toward a spring 2017 groundbreaking.